Be a homegating hero by hosting a game day party that’s worthy of the crowd’s cheers! 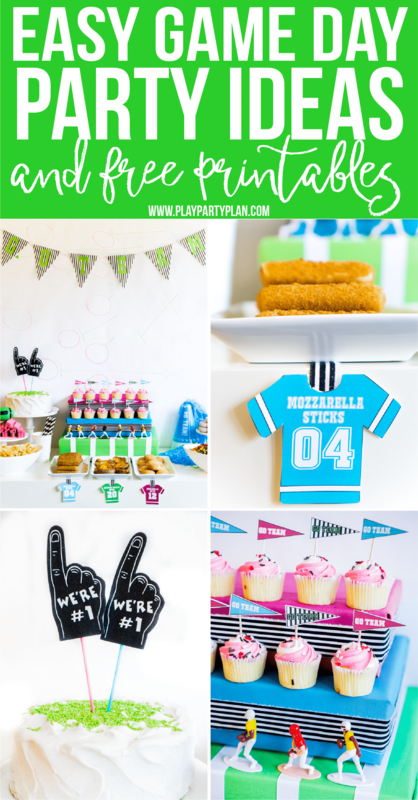 Use these game day party ideas and free game day printables to make hosting a game day party as easy as running the ball into the end zone with no defense! Thank you Farm Rich for sponsoring this post. All thoughts are my own. This post also contains affiliate links to products I recommend. This past week we hosted a game day party for some of our good friends and while not much of the actual game was watched, fun was had by all! 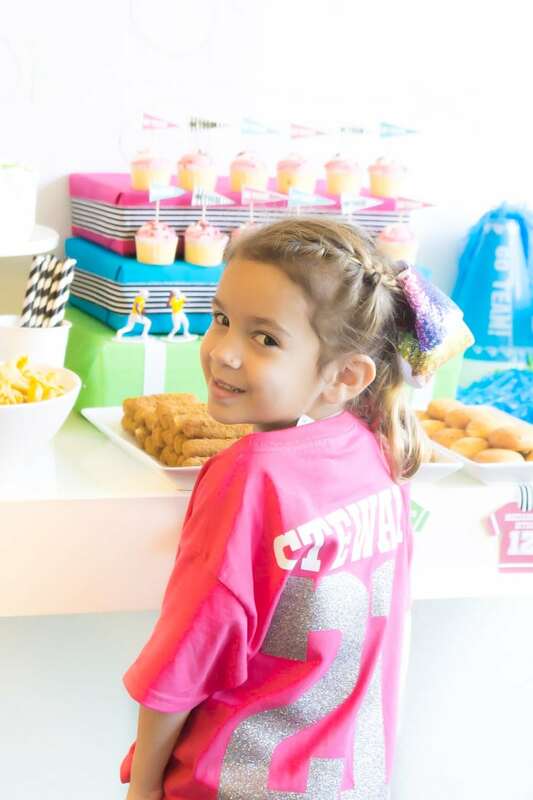 And luckily for you, we had our game day party early, so now you can use all of these ideas for the big game next week! 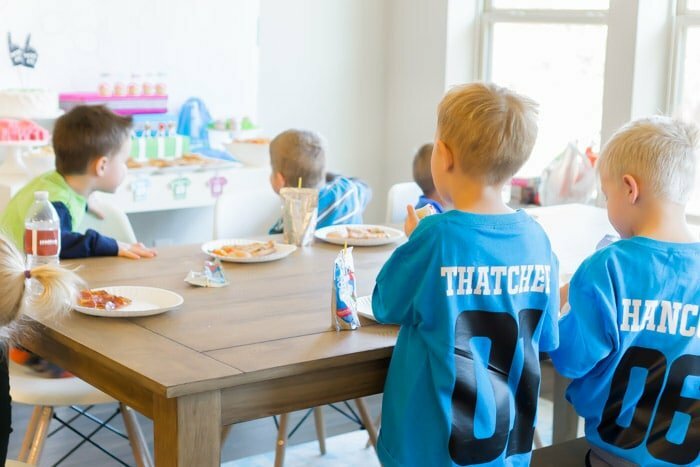 Our party was mainly kids and moms, but all of these ideas would work for the football loving men in your lives too! They’re perfect for hosting your very own no-sweat homegate for the big game on Sunday, February 3rd! I tried my best to keep my game day party table simple. Instead of going for the traditional brown, green, and black and white colors – I went with bright and bold colors instead to show you how to setup a party table with any colors you want! Have a favorite team playing in the big game? Make the table those colors instead or switch out my pink and blue with the colors of the whoever is playing. No need to stick with the boring brown and green of a standard football game. Go colorful or go home! The saying is something like that right? I created three different sets of printables – the colors shown in the photos and the colors for the teams in this year’s Super Bowl! Honestly, the only good thing about the Patriots beating the Chiefs and going to the Super Bowl again this year was the fact that I only had to create one new set of printables this year (since I’d already done the Patriots this year). I always try to create some sort of big visual in the center of my party tables, and this table was no different. 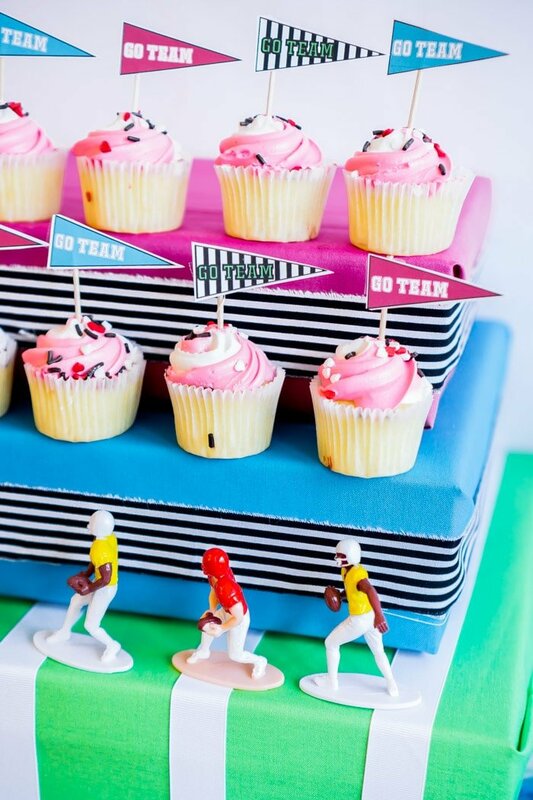 In the center, I created bleachers with cheering cupcakes by wrapping gift boxes (like these ones) in colored fabric. And that green box football field – that’s just white ribbon added to give the illusion of a football field. You can get the free printable cupcake picks in the printable set toward the bottom of this post. 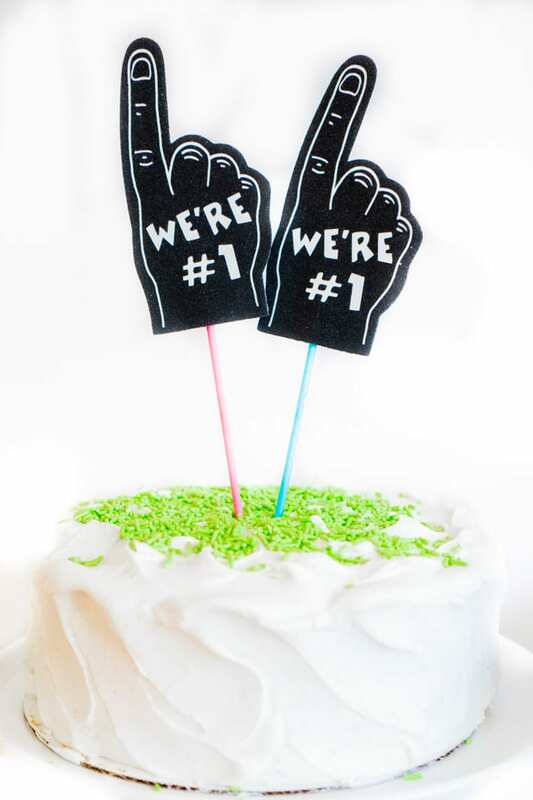 Printables are a great way to add a pop of color and fun to any party table! 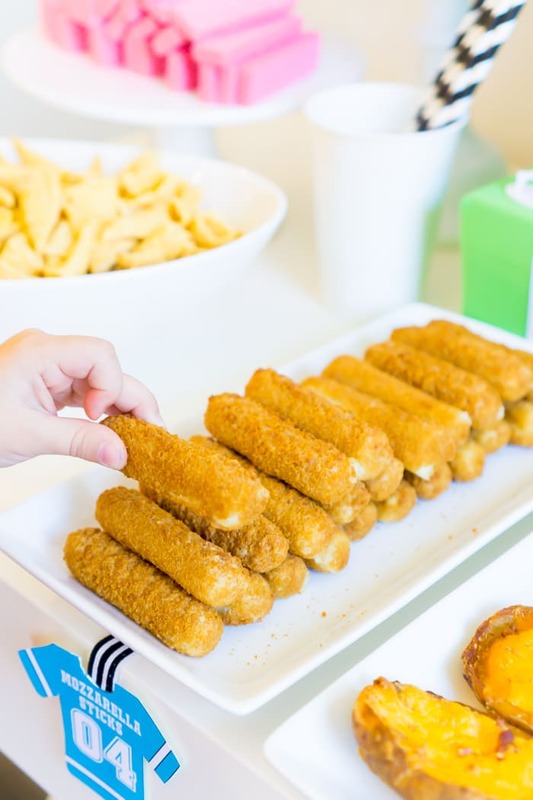 Front and center on my table, I laid out some of our (and America’s) favorite party snacks – Farm Rich snacks like mozzarella sticks, mozzarella bites, and stuffed potato skins! 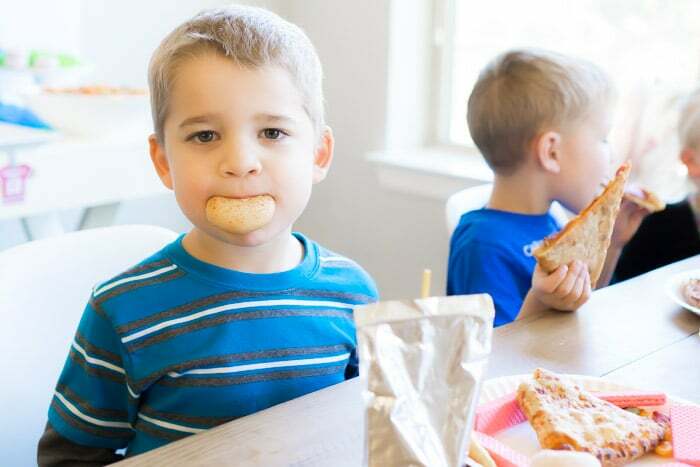 If you aren’t serving kids, I’d recommend cooking some of their jalapeno poppers as well! Parties are already a lot of work so the cooking shouldn’t be. 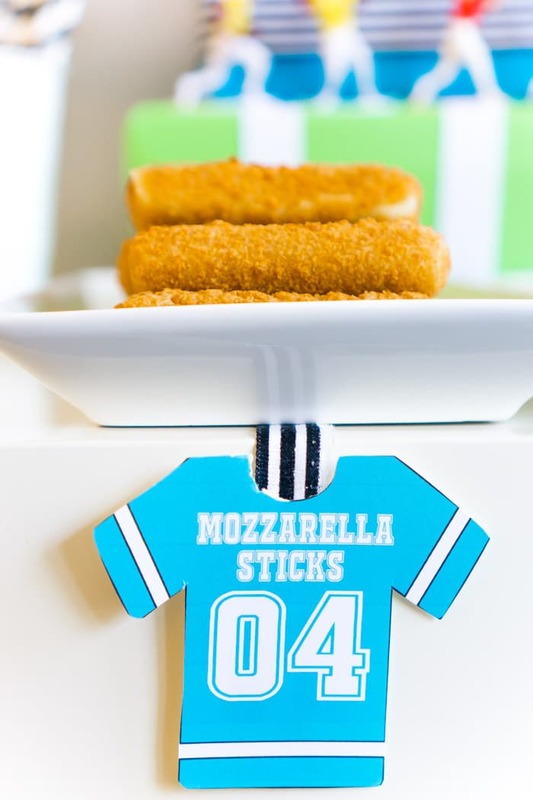 I made some free printable food tags that look like jerseys you can download below to again add that pop of color and design! For the Farm Rich snacks, simply pop them in the oven a few minutes before the party and serve warm. I typically serve them with this homemade marinara sauce but kids + marinara sauce running around my house full of carpet was just not happening this time. If you’re having a party for adults, marinara makes a great addition! 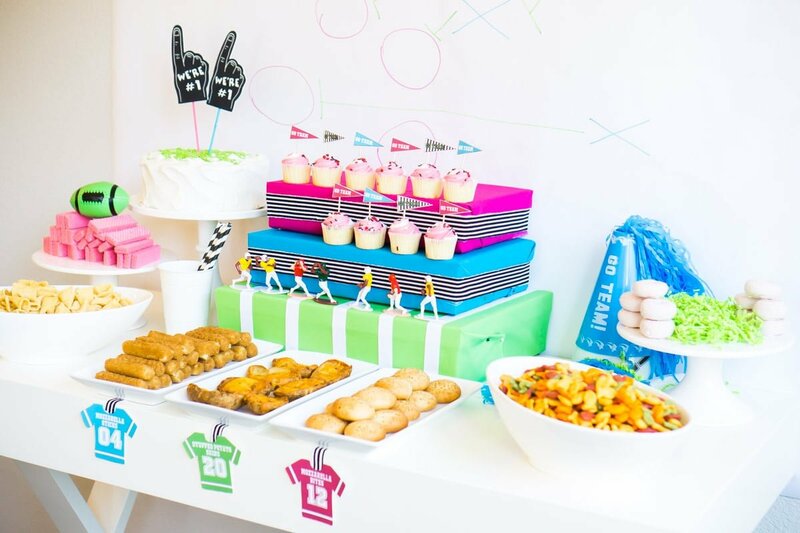 In addition to the Farm Rich snacks, I finished off the party table with a simple cake topped with cute foam hand toppers, a pyramid of pink wafer cookies, colored snack crackers, and Bugles that look like blow horns. Everything on my table was simple, family-friendly, and delicious! 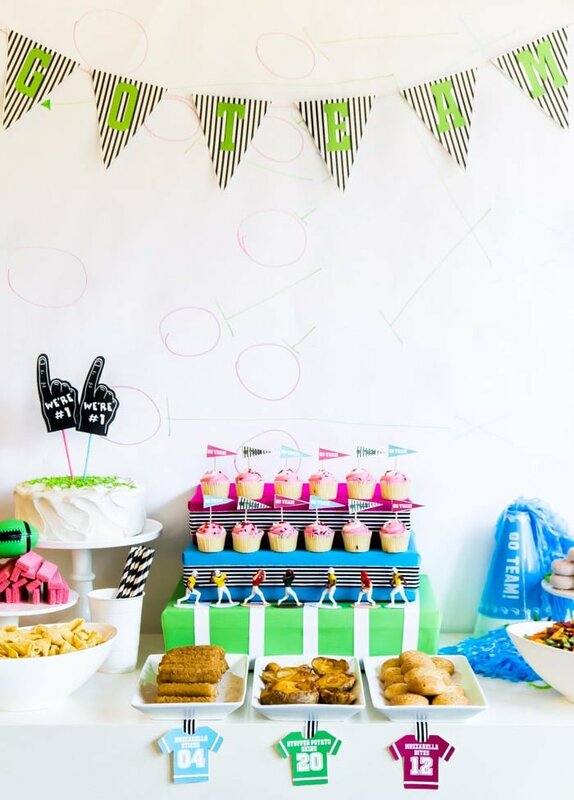 Instead of going with the traditional football decorations like I did in this football party and the million I’ve hosted before, I went with more pops of color and black and white to keep things simple and fun. Behind the table, I hung up a piece of white butcher paper with a colored football play drawn on. Across the top, I added a go team banner that finished off the look. 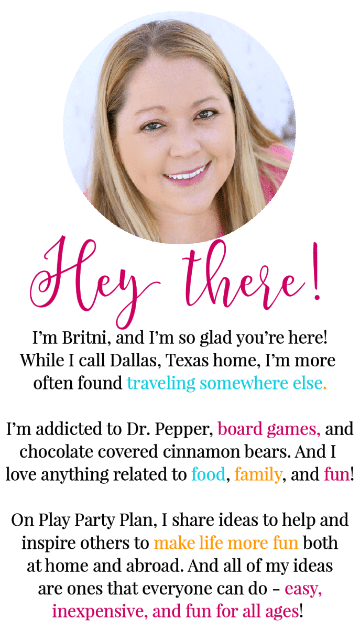 You can get the free printable banner with the printables below! On the table itself, I went with a variety of football icons – foam hands, football players, cheerleader pom poms, go team flags, jerseys, and more. I love how the printables really brought everything together in the design! 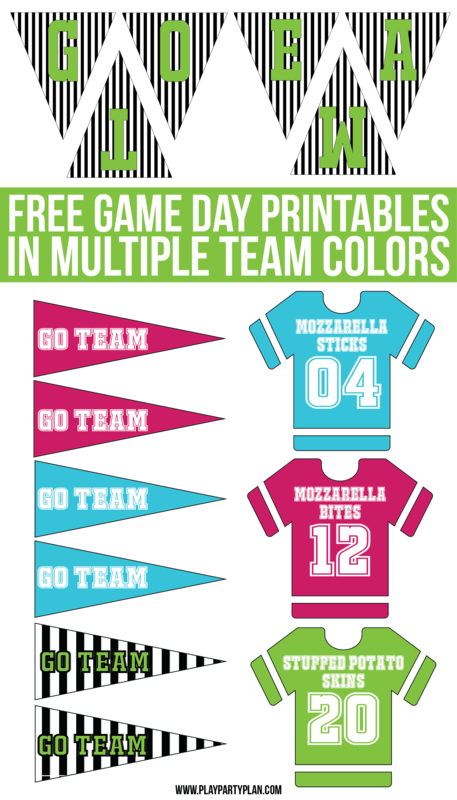 I created a PDF file of the cupcake picks, jersey food signs, and the go team banner you to use at your game day party! I created versions in the colors shown as well as colors that might work a little better for this year’s big game. If you need a different color or would like different food items on the signs, email me and I’ll try to help! 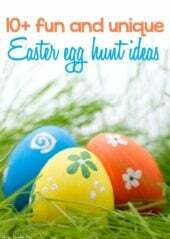 Enter your first name and email address below to get the free printables. You’ll be immediately taken to the PDF to download and receive a copy to your email shortly after. If you can’t see the form below, click here to get to the form to enter your info. Since you’re having a party for everyone to watch the big game, I recommend keeping the activities simple as well. 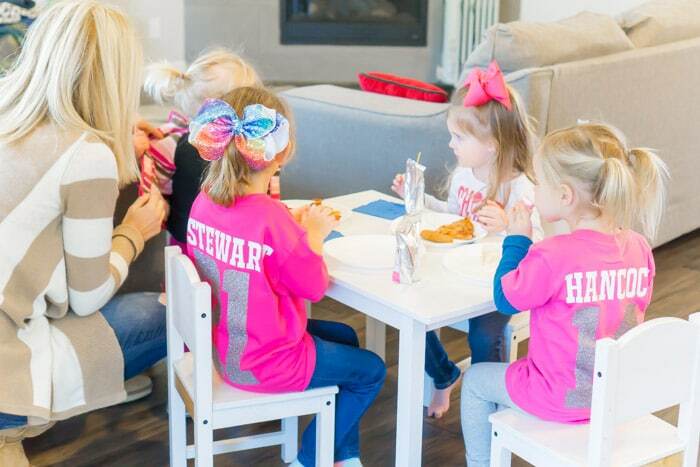 That’s the theme of this party right – a simple, no-sweat, game day party! We typically print out these football bingo cards to use during the game and sometimes during halftime we’ll do these football party games for kids or these football minute to win it games. They’ve all been big hits in the past. 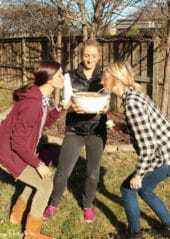 I recommend not planning too much though because at the end of the day, game day parties are about two things – the game and the food. 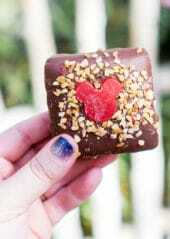 And with the help of Farm Rich + a few sweet treats, you’ll have the food covered! Any additional games or activities are just bonuses! The only other thing I did was make the kids jerseys with their name and favorite number on them. It’s not so much of an activity, but it put the kids in a great mood for the game! And that’s it! 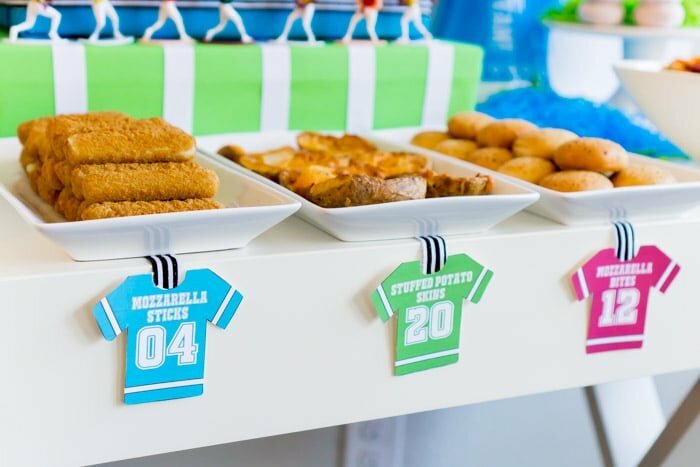 Stick to simple food like Farm Rich snacks, printables to add a pop of color to your party table, and simple football themed decor! Then spend the time you saved not worrying about the party enjoying time with family and friends instead! For more great homegating ideas, check out Farm Rich’s game day snack ideas! 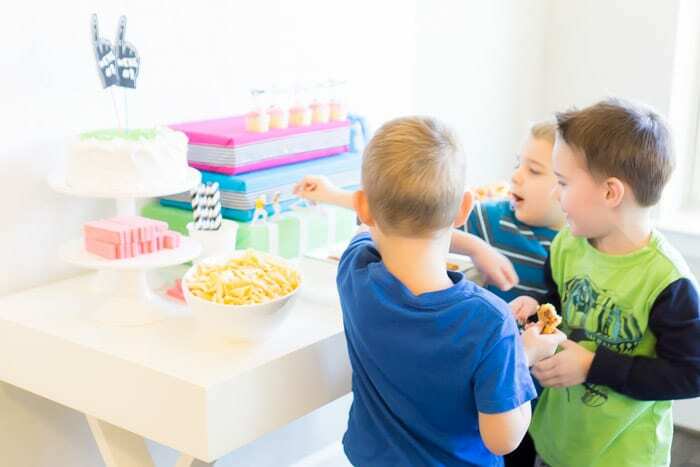 Don’t forget to pin these game day party ideas for later! Love this Britni!! 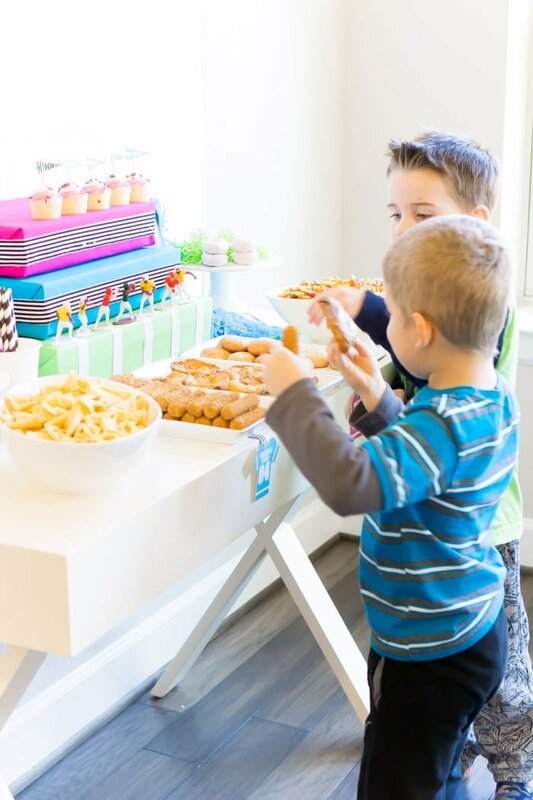 Such a fun and colorful twist from regular game day parties!